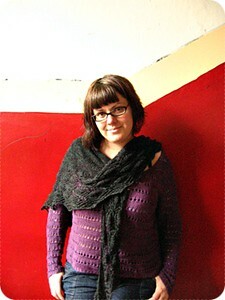 I have found a big grey shawl incredibly wearable to my great surprise. I shall have to make more neutral-coloured accessories. This revelation comes as no surprise to nobody but me: neutral colours go well with many things. 2. A handknitted sweater I have never mentioned before. This is indeed handknitted but not by me. It is an ex-display Rowan sweater - Sarah Hatton's Beatriz from The Lenpur Linen Collection - which I was lucky enough to pick up in Yorkshire last year during one of Rowan's garment sales. It is an incredibly comfy sweater and I wear it often (usually without my bra strap showing - sorry about that). The Lenpur Linen has softened a lot with each wash and the entire garment has a beautiful drape. If you have ever wondered where display garments go to live, you have your answer now. I am slightly incredulous that I am wearing something knitted to sample size as I am apparently too large for any of the New Look sewing patterns. And before you ask, yes, I have tried on various other (ex-)display garments and can fit all but the most fitted ones. Sizing seems very arbitrary at times. I do wear all my handknits but some knits get worn more than others. The two knits mentioned are worn often as are my Snorri sweater, the Forecast cardigan, the Haematite shawl, and the Art Deco shawl. I wish I knew what make these knits so darn wearable..
.. which brings me to the pertinent question: what makes you wear a handknitted item over and over again? Is it fit? Colour? General it-goes-with-everything-ness? Find more blogs participating in the Knitting & Crochet Blog Week by googling 2KCBWDAY4.